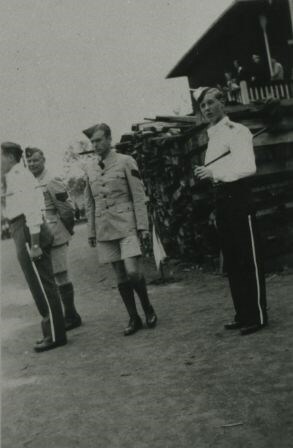 187 records – page 1 of 4. 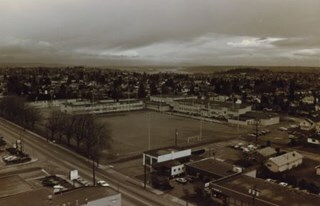 Photograph of Edmonds Street School, including the sports field, taken from the New Vista Tower. 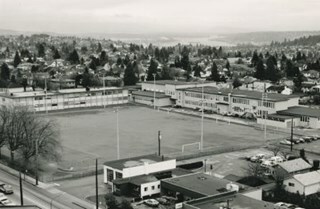 Photograph of one section of Edmonds Street School and sports field. 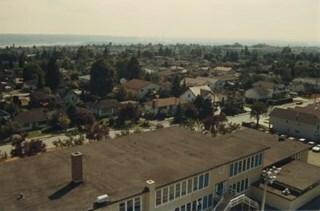 Photograph was taken looking south-west from a fire ladder above Edmonds Street School, with the school's rooftop as well as its surounding neighbourhood visible. 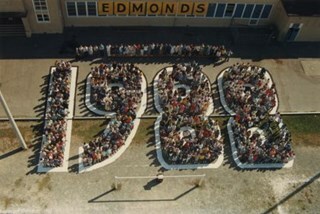 Aerial photograph of Burnaby's last Edmonds Graduates in a "1988" formation. 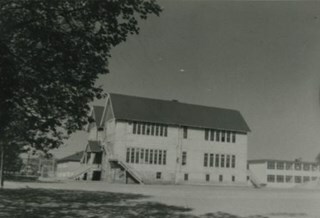 Photograph of the rear of the main building at Edmonds Street School. 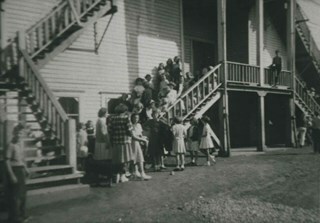 Students are lining up the back staircase. 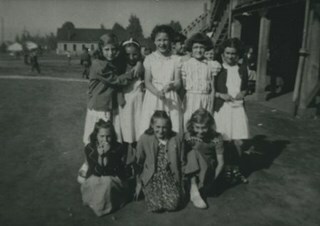 Photograph of a group of school-aged of girls, standing near the rear of the main building at Edmonds Street School. 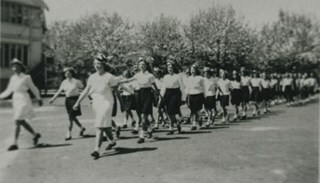 Photograph taken on Inspection Day of a girls gym class marching in formation. 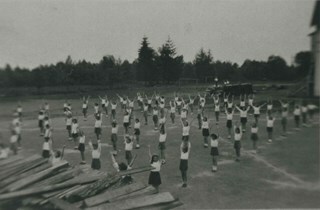 Photograph taken on Inspection Day of a girls gym class doing exercises. 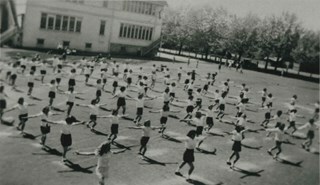 Photograph was taken on Inspection Day and shows a girls gym class doing marching formations. 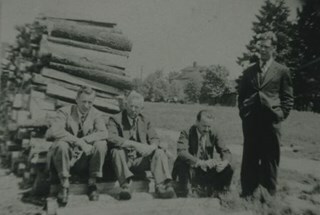 Photograph of four teachers in suits, from the Edmonds Street School, next to a woodpile. 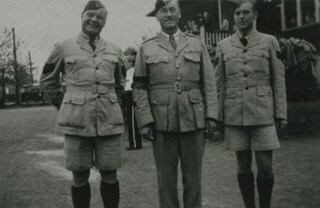 Three are seated on the ground, while the fourth is standing with his hands in his pockets. 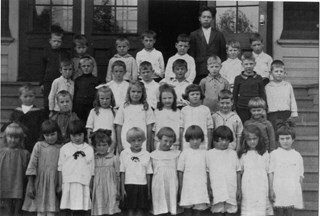 Photograph of an Edmonds Street School class lined up in rows outside of their classroom. 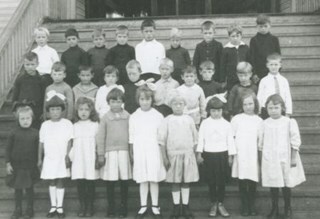 All of the children have their arms folded in front of them, with the first two rows sitting cross-legged, and the last two rows standing on their feet. 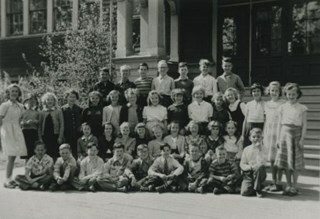 Photograph of an early elementary level school class lined up outside of their school in four rows, with the front row sitting cross-legged on the ground. 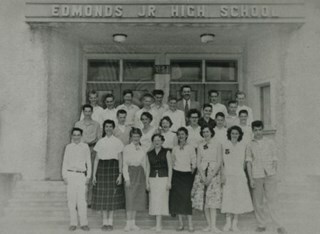 Photograph of a high school level class lined up the stairs outside of the Domestic Science Building in seven rows, with the front row sitting cross-legged on the ground. 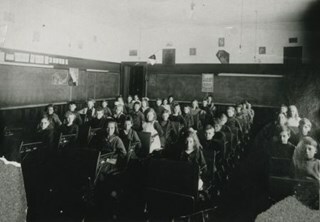 Photograph of the interior of Mr. Gilley's grade 8 class room in the Main School Building, with students seated in their desks. 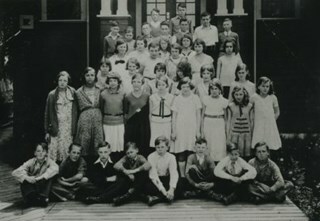 1 photograph : b&w ; 20 x 25 cm + 1 p.
Photograph of the grade nine class at Edmonds School standing together on the school's steps. 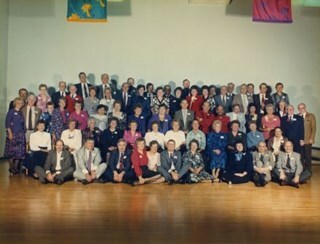 1 photograph : col. ; 20 x 25 cm + 4 p.
Photograph of the members of the grade nine class at Edmonds School from 1949, in 1989, at their 40th reunion. 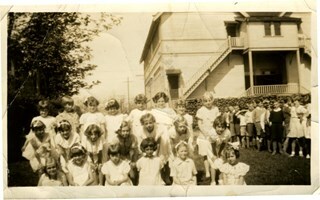 Photograph of a group of children identified as the Edmonds School second reader class, outside of the school building. Photograph of the Edmonds School primary class, outside of the school building. 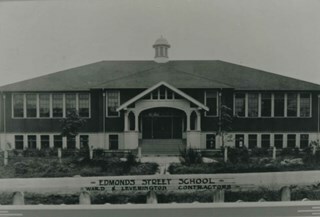 Photograph of the Edmonds Street School Div. 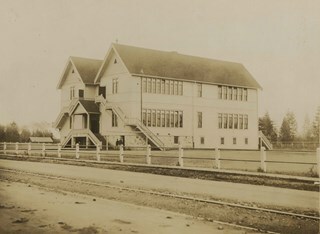 18 class. 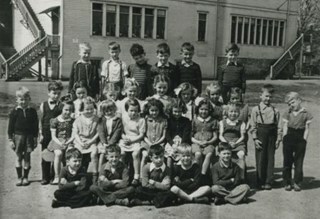 A note on the back of the photograph identifies the children as follows: Back row - Leigh Pudsy, Stanley (last name illegible), Ronnie Bondell, Gary Christianson, Ricky Howard. 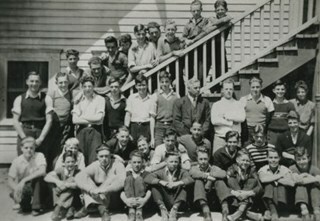 Second row - Douglas Goss, John Thomphson, unidentified, Jimmy Morsin, David Peterson, Neil Doa, Richard Legan, Kenny Matheson, Tommy Macarodo. 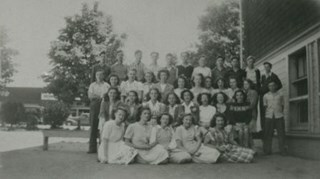 Third row (girls) - Gail McRae Roberta Halloway, Diane Sopta, Norma Videck, Audrey Usher, Judy Shaw, Dorothy Haig, Sherry Jones. 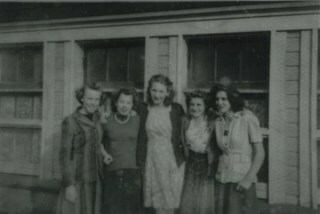 Fourth row - Gail Bruns, Maureen (last name ilegible), Marilyn Miller, Carol Rittenugh, Edith (last name illegible), Wilma Eddie, Diane Estrom, Linda Garlich. Front row - David Young, Lionel (last name illegible), Gerry Sung, Bobby (last name illegible), Ray Joannus, and Ronnie (last name illegible). 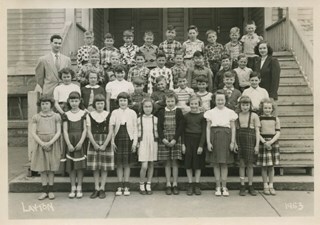 Note on verso reads: "Grade 6 Mr. Clark / Edmonds St. School" and identifies the students. 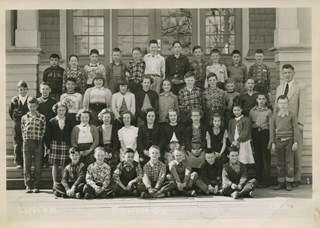 Photograph of the Grade 5 class at Edmonds Street School. 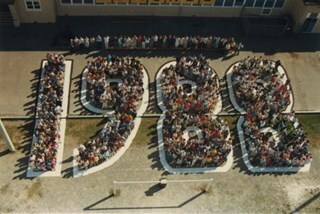 None of the students are identified. 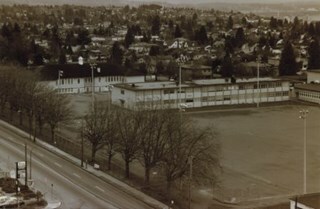 Note on verso reads: "Edmonds St. School / Grade 5 / Mr. 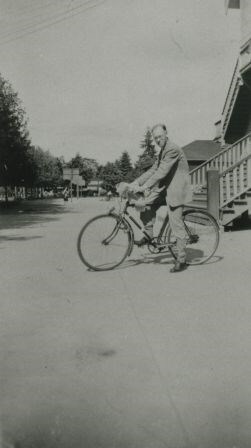 Waldie?" 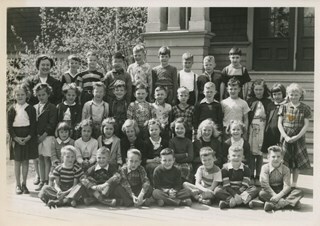 Photograph of the Grade 4 class at Edmonds Street School. 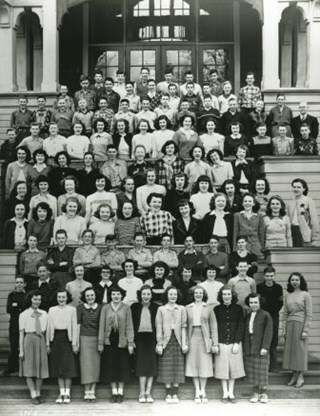 None of the students are identified. 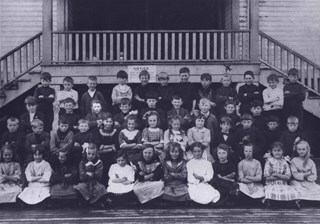 Note on verso reads: "Mrs. Burke / Student teacher / Grade 4 / Edmonds St. School"
Photograph of the Grade 2 class at Edmonds Street School. 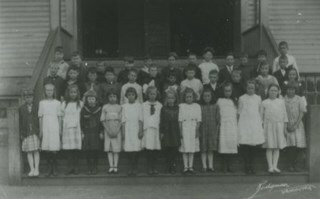 None of the students are identified. 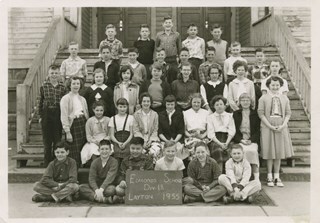 Note on verso reads: "Mrs. Dorscuit / Grade 2 / Edmond[s] St. School / Grades 1-6"
Photograph of Thelma Butcher in costume for an Edmonds School Christmas concert. 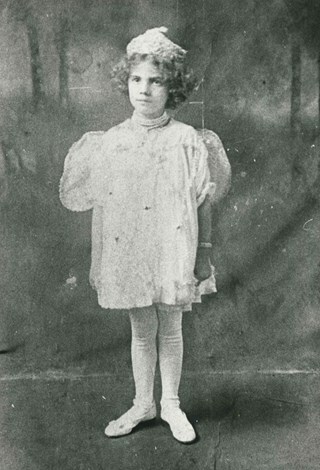 Thelma played a fairy queen who rode in a sleigh full of gifts pulled by a dozen brownies. 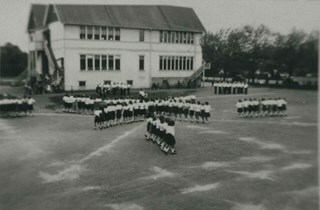 Photograph taken on Inspection Day of a girls gym class doing exercises in formation. 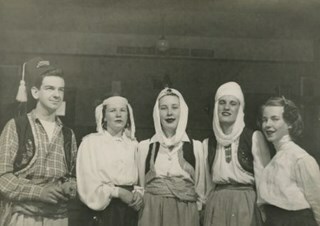 Delores Jackson is visible on the far left at the front; the only one dressed all in white.